Where did the last fortnight go to? Here we are, into May tomorrow (it's May Day Bank Holiday here in the UK so a long weekend off work for a few folk). Despite it being almost May, we've had a real drop in temperatures here during the week - and snow in a few Northern parts of the country. So we're not out of the woods just yet - and my woolly vest and warm bloomers are staying put for now! - next, cut a piece of double sided self adhesive sheet to a teensy bit smaller than the die cut panel and popped it onto a snippet of white card which I then trimmed down to the edges of the adhesive sheet. This really is a fun way to use up snippets, I always seem to have a lot of little strips that I can't bear to throw away. Just think of all the colour combinations, a dark or black background would look fabulous, red and green for Christmas, and maybe silver and gold perhaps for a touch of luxury? Another way to use the die would be to stamp a sentiment onto the plain panel, either a really bold, wide one or perhaps a shorter one with a die cut flower beside it. And of course, the strip cover up die itself can be used the other way up - so that the plain panel runs across the top third of the card. Very versatile IMHO. The prize is two dies, exactly the same as the ones I used today - MFT 'Diagonal Strip Sentiment Cover Up' and Memory Box 'Sketchbook Imagine'. I will split the prize if necessary, both dies work beautifully together but would also work very well apart. 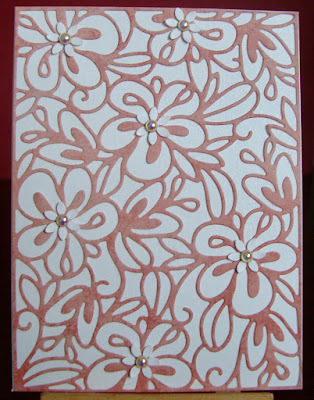 I've seen a few really pretty floral cards using the 'Imagine' die as the sentiment. But, as always - both items are one complete prize if you wish to play for them as a pair. The Snippets Challenge will run for two weeks from now on and the Playground gates will close at 11am UK time on Saturday 13th May. The gates will open again at midnight UK time on the same day. Be sure to call back next week to see the winner of last fortnight's prize plus my picks from the past two weeks - as well as another lovely guest designer too! Just recently, I got a couple of pairs of new specs from a well known UK chain of opticians shops. One pair is 'recreational' as they now call it, which is close work combined with computer distance varifocals. Plus my first ever pair for distance/driving, with the bottom part tuned into being able to focus on the important things on the dashboard, like the speedometer for instance. When I got home, was about to pop the cream paper carrier bag they came in straight into recycling - until I had a look at the pattern on the bag. It was rows and rows of black outline spectacles - not unlike the whole sea of spectacle frames you get when you walk into one of their stores. Then, an idea popped straight into my head for a card. I wonder how many of you will groan at the link I forged using pieces cut from the bag and the (admittedly purposely bought) sentiment? - final touch, a pair of googly eyes added with Collall All Purpose glue - only on one pair though, let's not go for overkill! Six more for the box, but I must confess that not all of the cards in that box have inserts in ...... yet. A rainy day job before it gets too out of hand I think! This is the first time I've used a 'Happy Holiday' sentiment on a card, ever. In the UK we tend to stick to Christmas and/or 'Seasonal' Greetings - so I was a little out of 'ye olde comfort zone'. The warmest wishes bit did it for me - and I think these will be winging their way to dear friends across the pond come Christmas. Merry Monday - use kraft card stock (Neenah 'Desert Storm' in my case). This is a pure fluke as I'd already just finished making these cards and was typing this when the Merry Monday challenge popped up! Now all that remains is to put all those fiddly little dies back into their storage - without losing any in the process! See what I mean about the lovely clean look? 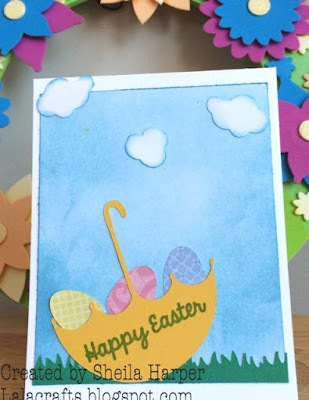 I love this card and Liz has used snippets perfectly to create a really super design. 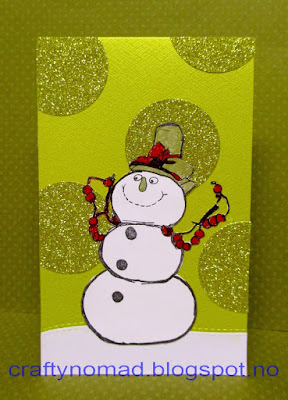 See those sweet little paw prints on the embossed background - it's details like that which really make a card special. I also know, from first hand experience, just how precisely and perfectly Liz's card are made :) A brilliant Good Luck card! 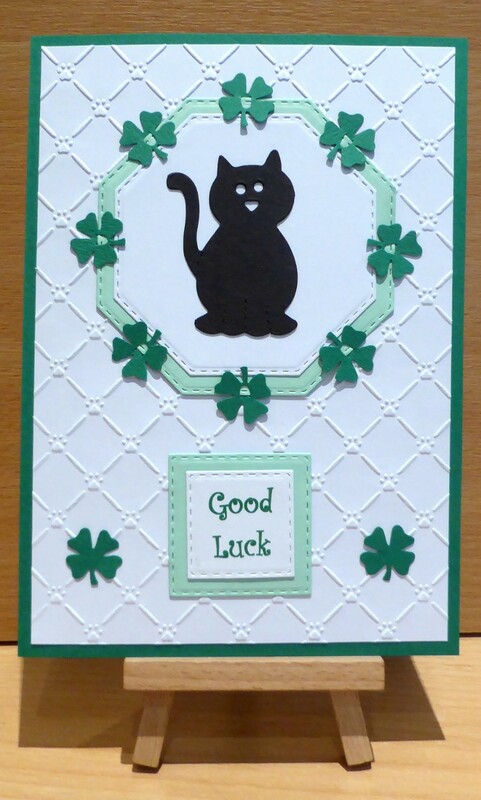 My good luck card is made entirely from snippets, except for the card blank and sentiment panel. The white embossed paw print background was even a snippet, although a fairly large one. Does anyone else have an overflowing drawer of white snippets??? I’m sure they just multiply when I’m not looking! The black cat is a very old Sizzix die, matted and layered on MB ‘Stitched Octagon’ die cuts. The four leaf clover ‘Clippunch’ punches I used come as a pack of two, one punching out the shape and one punching out a ‘u’ shape in the middle of the leaf, so it can be ‘clipped’ onto a separate piece of card. I know these two punches are at least 10 years old as I bought them on one of several visits to ‘Nellie Snellen’s’ shop in the Netherlands. Did you notice that I did a bit of name dropping there? If ever you get the chance to visit her shop in Sevenum, it’s well worth a detour. If you’re lucky, you may even get to meet Nellie serving behind the counter and discover what a friendly and delightful crafter she is. There is even a lovely coffee shop nearby, where you can deposit an uncrafty OH with their newspaper while you shop! Liz started her blog in 2012, although looking back it's quite clear that she'd been card making for some while before then! Some wonderful cards straight away and already the signs of the lovely clean style I love so much. I do so love that Santa's Washing Line die set - and apparently I 'forced' Liz to buy one for herself! I've lost count of the dies I've bought after being forced inspired by Liz! I've eased back on buying loads of craft magazines but I frequently used to see our Liz featured with one of her lovely cards, she's won tons of prizes and is a really prolific card maker. Do go and have a good browse around her blog - loads of great ideas there! Thank you so much Liz for making such a stunning snippets card as our Guest Designer this fortnight. And for emailing to and fro when you were away from a decent signal strength too! I picked this absolutely fabulous bag charm, made by Jane (who I privately refer to as Jane J to differentiate between her and Jane W!) as it ticks so many boxes. In fact, I do truly think ****it's worthy of a gold star****! Jane has carefully documented every step of making the bag charms, with lots of advice as the snippets are the shrink plastic she used! I love using shrink plastic, but also know it can be very unforgiving - so top marks to Jane I say! It's the worded flower, eyes AND lips in case you're wondering - do hop over to see how it was done! Jane, please take your gold star from the side bar - for your outstanding snippets make! If you haven't ventured into playing with shrink plastic yet - give it a whirl! I made some phone charms for a couple of friends a few years ago and they went down a real treat! I absolutely adore this wonderful card, made by Maura. The snippets were mostly white to begin with - beautifully stamped, embossed, die cut and sponged. It's just so perfect - a real delight for the eyes. Ruth brought a 'magic slider' card to share with us - and her blog post is so entertaining! It wasn't without little problems along the way - but Ruth kindly took photos, added a little video of her own (which cracked me up!) and also there's a link to a video by Kristina Werner which shows the whole process. I've wanted to make a card like this for ages and now it's on my 'to do' list! Thanks Ruth for the inspiration. That's my three picks - I do hope they will inspire you as well girls. Welcome to all of you new Playmates, we hope you come back and play with us again soon. Well done Heidi - can you please drop me an email with your address in and I'll post your prize off as soon as possible! I can't work out fully where you live but, wild guess maybe, could be USA. Plus you were playing for the whole bundle - so well done indeed! My email address is on the right hand side bar. That peek-a-boo window die is so, so popular (also hard to get hold of I believe) and I really did think that this could be a week when I had to split the prize. I hate to tease but there is another one of those dies waiting in the toy box here ...... for further down the line. And it's almost Rudolph Days once again over at Scrappymo's - a chance for you to use up some snippets for the Playground and also make a Christmas card at the same time perhaps? It runs from 25th April until the end of the month, as usual. And Mo always has lovely prizes to be won as well. There's an A4 piece of matt gold card stock, a snippet of SU 'Wild Wasabi' left over from a previous card I'd finished making - and a long slim Christmas card. Oh I do so love that Peek-a-boo Window die. 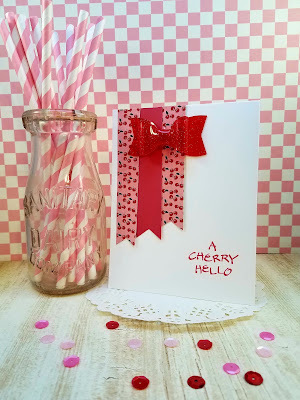 I've also seen it used for shaker cards around blogland - it's just perfect for that of course! It's time for a new challenge over at Cuttlebug Mania and this fortnight's theme is 'A nice cuppa' - it can be coffee or tea. Apart from the jiggling about with the stripy snippets and the cups, this was a really easy card to make. The background to the black and white 'retro' cups and red theme goes back to when I returned to the UK after being incarcerated at boarding school. Bit of a culture shock for me but I recall that my Mum was so very excited and really looking forward to finally settling into my parents 'much longed for after a lifetime of travelling' new (and their very own) house that was being built whilst we did our last stint in Army accommodation. Knowing they wouldn't be moving very far ever again, my Mum certainly did some nest building and one dinner set 'for every day use' she bought was quite daringly black and white - and the teacups had black saucers as a contrast. Super modern at the time of course and before the days when we just used mugs. The kitchen in the Army house had red and white cupboards - hence my colour scheme today! Happy Easter Sunday everyone! Whatever you have planned for today, I hope you have a lovely time. I'm just hoping we have some sunshine - last week was glorious, for a few days! - found a little snippet of true rose pink card, backed it with Stick-It adhesive sheet and die cut it using a Crealies rings die - the die has no name but is reference number 'CLDR11'. 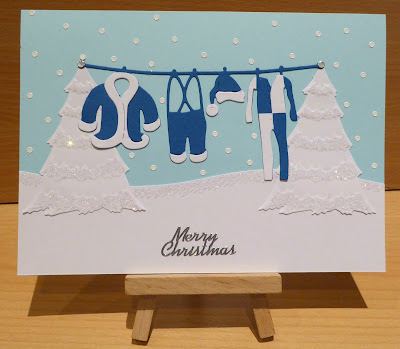 Elizabeth sent me this die a while ago - with a challenge to see how I could use it, I can see it being a really useful embellishment die for all sorts of cards including Christmas! 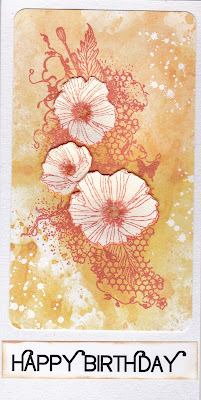 - the sentiment (from an Inkylicious set called 'Friend') had slightly stamped onto the card anyhow. Held in place as it was by the Misti it was just a quick re-ink, re-stamp and it was done! - added the set of die cut rings to the panel - finished! So I learned something new about the Misti when making this card. It's fine to position all the stamps you want to use at one time, even if some are thinner than others. You just peel away the thicker ones as they stamp and then the next thinner ones will make proper contact with the card - and so on I guess. I also used an L-shape from the new Misti 'Creative Corners' set for the first time - yay! It allows you to push a piece of card away from the edge of the Misti (I knew my stamps were close to the edges and that can sometimes cause issues with getting enough pressure), yet you still keep perfect positioning. Need to play a lot more to try out all the additional things the Creative Corners set can be used for - repeat stamping and diagonal placement of sentiments for one! Jennifer McGuire has some great tips and there are lots of others to be found on line as well. The one thing I would say is that it's best suited to the standard sized Misti rather than the mini Misti (the L shape piece is too big for a mini Misti I understand) although some pieces will fit. And, at £16 or so, which isn't much more than the cost of some polymer stamp sets, I think it's a good investment! I was really pleased how this card came together in the end as I picked the items I wanted to use and only then worked out the design - rather than the other way round. I was driven by the fact that there were three items that had been in the toy box for quite a while and two of those had been kindly donated. I hate to take forever offering donations as prizes (my record was goodies from our lovely Darnell, and still feel bad that it took me so long for 'the muse' to be right). In fact, right now there's just one donated item left (really cute as well). I have plans for it ASAP Val! But never fear, the toy box is looking healthy with quite an assortment of goodies that I've bought lately. Watch this space! I will split the prize three ways if necessary, the Kaisercraft 'Butterflies' stamp set kindly donated by Megan, the Crealies 'rings' die, kindly donated by Elizabeth ....... and the Inkylicious 'Friend' sentiment stamp set from me. But, as always - all items are one complete prize if you wish to play for all of them together. In truth, it isn't often I end up splitting a prize but that's absolutely the luck of the draw - not me saving on postage! The Snippets Challenge will run for two weeks from now on and the Playground gates will close at 11am UK time on Saturday 29th April. The gates will open again at midnight UK time on the same day. It's still a maximum of ONE entry and please say in a comment if you wish to play and be a possible winner of the prize. The prize is all items together as a single prize, unless you really do only want to try for a 'split' as I explained above - in which case I'd do a further draw for the other item(s). Please also link back to the Playground in your blog post to be eligible for the draw. Be sure to call back next week to see the winner of last fortnight's prize plus my picks from the past two weeks - as well as a lovely guest designer too! I'd like to enter my snippets card into the current Butterflies Challenge (closes on Wednesday) where the theme is 'W is for Window and/or the colour Rose'. It's ages since I joined in (bad me) - but here I am at last Mrs A. And am still waiting for an explanation of these plans you say you have for the duck pond Missus! Sigh, I've slipped on my '12 per month Christmas card target', so the other day I set to and made a batch of six identical cards. I know, boring for some people but once the 'production line' is set up it really is a time saver in the long run. - used a sentiment from the Personal Impression 'Many Greetings' stamp set and Memento 'Tuxedo Black' ink to stamp 'Merry Christmas' on the white panel. As I was making six at once, this stage was a breeze using the Misti! Ha! My in-house critic just couldn't 'get' the mittens on a Christmas card (he's so behind with trends at times, bit like me really) but at least he didn't ask if they belonged to the Lone Ranger! Snow flakes would have been better but my punches, dies and little sequins are all too large - or so I thought! I could possibly have used the 'fall out' from my Martha Stewart snowflake border punch - but of course that only occurred to me when it was too late. Those hot fix nail heads can't be prised off - not that I tried. So, Lone Ranger mittens it is - note to self for next time though! Almost half way through the month and certainly need to get a wiggle on to start my 12 Christmas cards for April - for some reason, much less enthusiasm this year and if it becomes a chore then I'd rather not play. Speaking of chores and playing - I can't say often enough just how much easier it is running the Snippets Playground. The easing of pressure is phenomenal and I'm so grateful you all went along with the new format. Two of my favourite challenges, no pressure and you can always just go for the 'Anything goes' option as well! Hazel works really hard on these challenges so it would be lovely if you could join in - when you're in the mood for making Christmas cards of course! I've written on here before about a beautiful Easter Egg I was given as a child, made from sparkly sugar paste. It was beautifully moulded in sparkly white with little piped pink roses - and through a little window you could see a scene inside. I think it was possibly Cinderella's coach - I know, not really Easter but sure to delight a little girl who believed in magic! It was far too pretty to eat and I kept it until it eventually went yellow and a bit sticky, sigh. - poured iridescent glitter all over the egg front and patted it into place in the sticky apertures to emulate the sugar sparkle. Sheesh, glitter sparkling everywhere ........ as well as on the card of course - that stuff travels! - added a little Mei Flower white pearl to either end of the sentiment label - finished! The other memory was when I rummaged through the (several) RUB boxes of flowers in the craft room. I really thought those little ribbon rose and bead embellishments were the height of sophistication for card making ........... a long time ago! Time for a bit of a blitz here I think! Again, we're halfway through the fortnightly challenge in the Snippets Playground and it's time for our Guest Designer, some 'picks' of the fortnight and of course the prize draw. Isn't it fabulous?! Such a great idea, wonderful use of snippets and I totally love the image plus super sentiment! I also love how the faux stitching almost convinces you that the bag is made from fabric pieces! My snippets project is a decorated Easter treat bag (plain bag from Hobbycraft). I raided my My Mind’s Eye ‘Now & Then’ paper pad for snippets...and found lots of thin-ish strips (the kind you get when you trim a full sheet down), so used those to make my background...distressing the edges & adding some faux stitching. 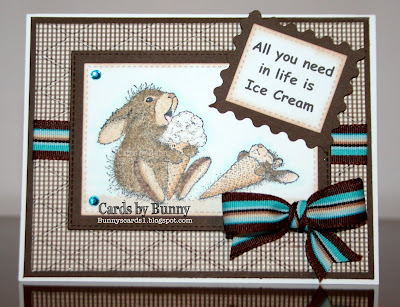 I coloured the bunny image (‘Spring Chick’ by Penny Black) using watercolour pencils, then cut it out using a Nestie die...I cut the scalloped mat for the image from the pink card behind the paper strips. I also used a tiny snippet of patterned paper to paper piece the egg shell...adding a little shading with a pencil. I stamped my sentiment on to a snippet of white card and matted that with a snippet too, then added a couple of co-ordinating paper flowers. 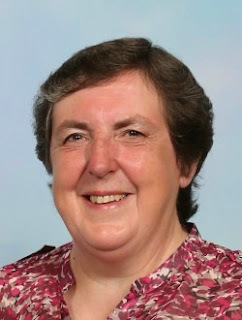 And, here's a photo of our lovely Helen - I detect a mischievous twinkle in her eyes! Looking back through Helen's blog, there's some fabulous work to be seen - and Helen has been a 'pick' several times in the Playground needless to say. card - yay for Helen! No wonder she's on a few top design teams, with a following of over 500+. Whilst I was 'furtling around' on the internet (I love that expression Sarn/Sarah!!) I came across something else - which cracked me up! Anyone remember the 'ALS Ice Bucket challenge' a while back? Just go to this link if you want to see Helen being soaked! She'll probably kill me for publishing it - but it does show just what a few searches will turn up on social media and such! One lovely tradition Helen has is to make a few calendars each year, for close family I think. For UK gals who might want to do the same, the blanks come from Papermill Direct HERE (they only seem to have 2017 calendar blanks at a reduced price at the moment) - it's something I would love to do for 2018 so will be keeping watch on the website. Thank you Helen for making such a stunning snippets project as our Guest Designer this fortnight! And for emailing to and fro when you were struggling with internet problems as well - what a star! So, let's move onto my picks from this past fortnight - gold star alert! Now this is a tricky one - Heather already has one gold star in the short time they've been featured here) but this card absolutely leapt out at me as being such a brilliant way to use up snippets! Check out Heather's blog and there are some really good step by step instructions how to do this yourself. Very well deserved second gold star Heather! There's a badge on the RH sidebar if you wish to take it for your blog - no offence if you don't though. I still stare at the first card shaking my head slightly and thinking what an incredibly determined lot you all are! 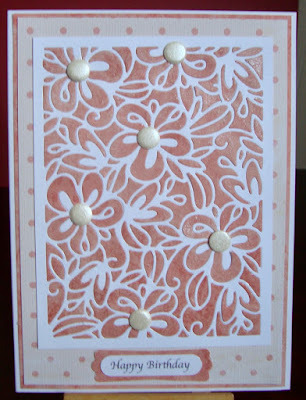 I absolutely adore the soft peach tones of this fabulous card, made by Glennis. It really is so elegant, beautifully made and of course used up some white snippets for those lovely flowers! That's my three picks and once again I focused very much on some interesting ways to use snippets - which hopefully will inspire you. Welcome 'Little Miss Lotsanames' - who I think we'll call Iona as we do have another Bunny following the blog and she may well come to play soon! Hope you come back and play with us again - looking at the prize draw result I sure hope so! This stunned me - it's only happened once or twice at most that a new Playmate wins straight away on their first visit! Having said that, I guess the odds will be similar whether it's a first visit or not - depending on the number of entries....... it's all the luck of the draw. Well done Iona - can you please drop me an email with your address in and I'll post your prize off as soon as possible! My email address is on the right hand side bar. And here's a little 'heads up' as published by our lovely Linby on her blog. 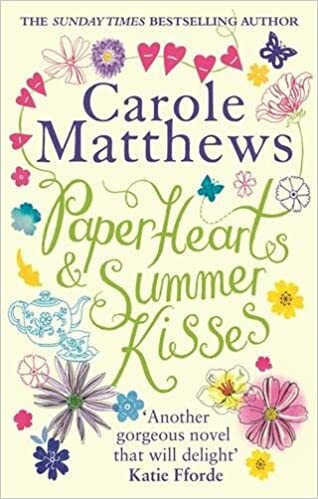 Carole Matthews is an author who I really like, and she has a new paperback book out called 'Paper Hearts and Summer Kisses'. It's also available on Kindle and I just finished reading it. It's a novel but also based on the real life story of Christine Emberson, a well known UK crafter - and I truly recommend it! Anyway, keep those snippets entries coming girls, you still have a week left to play HERE remember! Next week is Easter Sunday so I expect you all to be wearing brand new clothes, shoes, white socks, a little hat and white lace gloves. I know that was the tradition when I was a child at least :) Talk about dipping into the past! We have a lovely little 'beauty and health' centre close by - and for a while now I've been treating myself to a regular pedicure session, just to have my tootsie nails trimmed and a foot massage. Sadly, Shirley, the lady I see, isn't in great health herself (she has a back problem just for starters!) and she's decided that it's time she retired. I'll miss her loads as we're very similar in outlook, sigh.